In general I am not a fan of sweet potatoes. Yes, I will eat them fried, or as oven fries, and even occasionally in risotto, but besides that I would rather not have them. I think the sweet potatoes covered with marshmallows that I grew up eating, did me in for sweet potatoes. However, this soup is changing my mind when it comes to sweet potatoes. 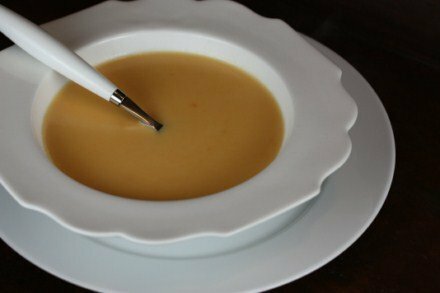 I really enjoyed this soup and it was a great way to get my kids to eat and enjoy sweet potatoes. I think you will be seeing this soup on the menu often this fall and winter. It is so easy and so good. Not only that it freezes well, so I can make a large batch of it to use for lunches through out the week. In a large pan place chicken broth, potatoes, sweet potatoes, salt, and peppers. Bring to a boil and reduce heat to low. Cook until potatoes are tender. This takes about 15 minutes, depending on how large you cut your potatoes. 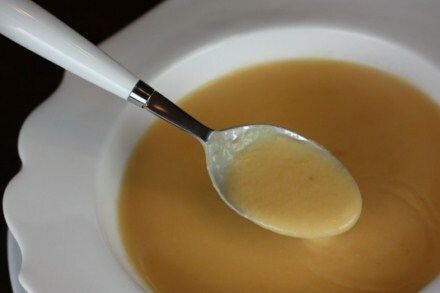 Once potatoes are done puree the soup. You can either do this with a blender, be careful though putting hot liquid in your blender, or use an immersion blender. Place soup back in pan and add cream cheese. Heat and stir until cream cheese is melted into soup. Serve with bacon sprinkled on top. mmm! sweet potatoes are my favorite. Sounds delicious! I will have to try out this one. This looks delicious. I love sweet potatoes, but my family is not fond of them. I have some on hand and have been looking for a recipe. This looks like something they might actually eat. Thanks! This is a great way to hide or at least semi hide sweet potatoes. 🙂 I hope you enjoy it! Sweet sweet potatoes have never been my thing. My family never did the marshmallow on top or candied sweet potato thing for Thanksgiving. Plain baked sweet potatoes are my favorite way to have them. Only lately have I been cubing them to add to stews that have a Southwestern flavor (or even (African) for different experiences. I hate peeling them for fries, or anything else so I tend to stick to the simple roast and mash after peeling for any recipe. It’s hard to wrap my mind around cream cheese and sweet potato, but I need another way to use such a nutritious vegetable. I love that it freezes well, so few creamy soups seem to. This will definitely be on my “try” list. Just made this for dinner. It was delicious! My husband is still sitting at the table raving about how wonderful it is! Thank you for the recipe!! I had a HUGE bag of sweet potatoes given to me by a friend and wasn’t quite sure what to do with it. It was a little spicy for the kids, so I might use even less cayenne pepper but they still liked it! trying this tonight! i have a few that I need to use before they go bad.. If it’s a hit (and I’m sure it will be! ), I plan on making this when I got to visit my ailing grandmother who isn’t eating well these days. Thanks for the recipe! I make this one about once a week. I am not a bog fan of sweet potatoes, however this sounded good. My husband, who is a picky eater and the rest of the family and anyone who has tried it, loves it!! I always get, “can I have the recipe?” Absolutely amazing flavor. I have had trouble with the cream cheese melting though, so I add it to the blender after I blend the potatoes and the lumps come out.